Released only in eastern Europe, this game bears the distinction of being the first-ever Simpsons video game, released before The Simpsons even became a series. Unfortunately, not much else is known about the game. 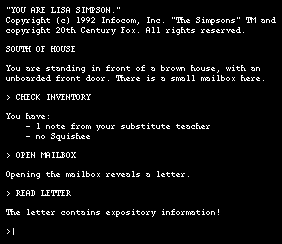 Apparently produced under the delusion that Bartmania would soon morph into Lisamania, You Are Lisa Simpson was the final text adventure game released under the Infocom brand. In the game, players take on the role of Lisa Simpson and solve challenging mind puzzles, while navigating through various ethical quandaries. The game sold less than 100 copies nationwide, but managed to achieve minor "cult" status within the interactive fiction community. Kemco lost their Simpsons license fairly late in the production stages of this RPG, forcing the cash-strapped Japanese company to simply alter all references to The Simpsons instead of scrapping the game altogether. 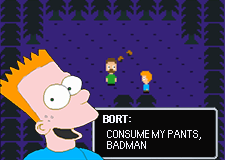 Long considered an "unofficial" entry in Simpsons video game canon, Bort Simpleton had a brief resurgence in 2000, when various lines from the poorly-translated game became viral internet memes. Office users could replace the infamous paper clip assistant "Clippit" with a downloadable licensed character extension pack from Microsoft's website. The Simpsons pack included Homer, Bart, & Krusty and featured over 16 unique animations. A small mini-game called "Krusty Fun Juggle" was included as an easter egg. Designed for the short-lived Tiger Electronics game.com system, The Simps attempted to capitalize on the "virtual pet" craze of the late '90s. Players took care of a Simpsons character (Homer, Bart, Lisa, or Santa's Little Helper) - feeding them, cleaning up after them, etc. - while training them to compete in go-kart races. An entirely forgettable game. Although the player is ostensibly playing as Homer, no Simpsons characters are actually seen or heard in the game. 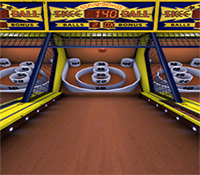 Kotaku named it the 5th worst skeeball game of the decade. Epic Homer was the first Simpsons game produced exclusively for the Nintendo Wii. Critics praised its innovative gameplay and witty cutscenes. However, the game was banned by the ESRB after controversy arose over a level in which the player "strangles" Bart with the Wii Nunchuks.